Helping you find the best books to read aloud to your children. In-depth reviews of the best picture, chapter and illustrated books. Dad also recommends his favorite children's book series and treasuries. Jenny Linsky - let me whisper in your ear. My girl and boy love you. You touched their young hearts. They would give anything to put their small arms around you. Jenny, please don't tell, but my daughter is your biggest fan. 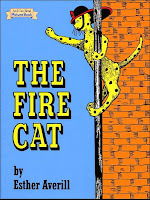 And my son is absolutely crazy about your courageous and loyal friend, Pickles the Fire Cat. Jenny Linsky - do you want to know why they love you so? After we finished our second reading of the 176-page book containing the first five stories about your life - it hit me how they will never forget you Jenny. I am certain of that because your story is so delicate and powerful. Jenny Linsky - a name that will imprint a deep mark on any child. 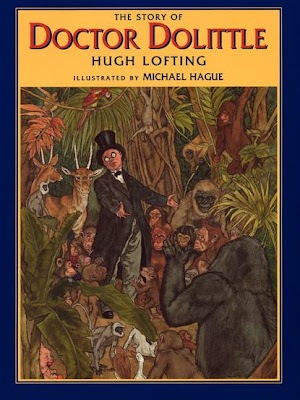 Let's tip our hat to the glamorous New York Review Children's Collection for reissuing these charming stories for our kids in such fabulous and sturdy editions with their red cloth spines. Read Aloud Dad loves the NYR Children's Collection books. They are different, they are vintage and all of the books are as classy. We all want our kids to be classy - so lets put them get in touch with classy books. 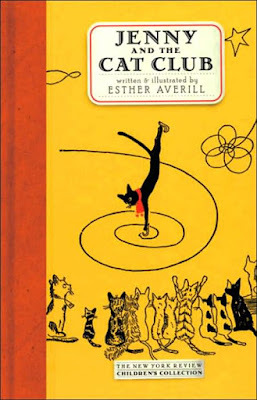 Esther Averill's stories about a bashful cat that aspires to join a fascinating Cat Club in the neighborhood went out of print ... until the good people at the New York Review Children's Collection decided to re-print these gems in 2003. 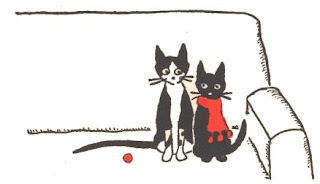 What is so special about Jenny Linsky, the cat with the red scarf, you ask? For long Read Aloud Dad was stumped. I simply couldn't put my finger on the right answer. Indeed, there is something strange in these stories about Jenny Linsky and her aspirations to join the local Cat Club. Read through them and ask yourself: why do these story reel you in so strongly with their apparent simplicity? Not an easy question to answer. Oh, I forgot to mention. You are afraid that these stories are dated? No, do not worry, quite the contrary. They are perenially modern, as every great book should be. And if you are worried that the books might be too verbose (potentially boring?) for your young one(s), that is clearly not the case. We read them for the first time half a year ago, when my kids were 3 years 6 months old - and they loved them! Back to our question. There is something that makes these Jenny Linsky books different. Let me clear any suspicion that you may have ... no, I am not a cat person. Far from it. Never had a cat, never will. Yet, this bunch of Greenwich Village cats is undoubtedly a group of cats with clear-cut characters. Author Esther Averill manages a rare feat, with just a couple of lines of writing and her clear masterful black & white drawings, she fully describes all the members of the Cat Club. In a stroke of genius, she also adds an occasional tinge of red to her drawings to illustrate Jenny's red scarf, her brother's (Checkers) little red ball, the fire helmet of Pickles The Fire Cat. Oh, talking about Pickles, don't miss my glowing review of this great Jenny Linsky prequel. The lack of complexity in her drawings and her focus on the main traits of every cat - makes every message unmistakable and easy to pick up for even the youngest child. Readers continue to ask me the same question: Was Jenny real? Yes, Jenny was real - a very real cat. I knew her in the days when I lived in a house by the big garden where she lived with her master, Captain Tinker. Night after night, from my garden window, I watched little Jenny, wearing her red scdarf, jump from the downstairs window of the Captain's house to attend the meetings of the Cat Club ... at the maple tree. There are no surprises in the cat society of New York's Greenwich Village. Every cat knows its place in the club and the club can be entered only if a newcomer is able to prove that he/she posseses a special talent. It is a club that expects excellence of its members. "Come all ye cats and kittens. To the Cat Club Jamboree"
Meetings are presided over my a well-fed cat named ... what else than ... Mr President. In the fifth and last story in this book, we witness Jenny's agony as she attempts to convince the Cat Club to take in her newly adopted brothers Checkers and Edwards. Before they become eligible for full membership, they must woo club members with their respective talents. The life of your dear little pumpkin will definitely be much poorer without these stories about a little black orphan cat that lives with Captain Tinker in Greenwich Village in the 1940s. Especially as Jenny Linsky is still with us in the 21st century. We need to surrender to her innocent charm. Yes, I know, there are some great children's books out there. My point is there are the exceptional books available as well - like Jenny And The Cat Club: A Collection of Favorite Stories about Jenny Linsky. It boils down to the book's larger-than-life quality. The sheer credibility of its story or its characters. Suffice to say, Jenny and The Cat Club is among the exceptional ones. While reading this masterpiece aloud, you simply feel that Jenny Linsky is not a "story cat". This is not a figment of someone's imagination. 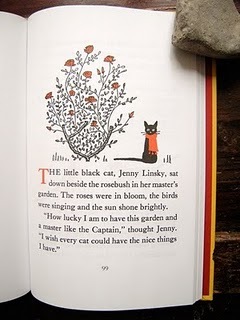 In 2003, the New York Review Children's Collection assembled the first five stories about Jenny Linksy into a new book. Jenny Linsky and her club members are here to stay. Forever among new generations. How The Brothers Joined The Cat Club. When (not if!) you fall in love with this first Jenny Linsky book - you just have to turn to the NYR Children's Collection for the rest of the Jenny Linsky stories that were also reissued in these beautiful hardback editions with fabulous yellow covers. My advice to parents embarking on the Jenny Linsky collection of books is to read the first book first - Jenny And The Cat Club: A Collection of Favorite Stories about Jenny Linsky. This will ensure your listeners will be properly introduced to Jenny's story and it helps to establish a strong emotional connection. One of the remaining books (The Hotel Cat) in the collection was too advanced for us to read several months ago, but I expect it will be more suitable in a year or so. I will end with a personal message from Read Aloud Dad to Jenny Linsky. You are such a gentle and caring soul, a darling who was almost forgotten. Fret not, Jenny. You will make friends with new generations. No person that reads about your life, your kindness towards your adopted brothers and the adventures of the Cat Club can ever forget you. For more background on "one of the most engaging cats in children's books", please also check out a Book-A-Day Almanac review of Jenny and the Cat Club by Anita Silvey. I don't know how they managed to pass under your radar! You said it best - let me quote your words - they sound delightful! As you love vintage stuff and classy books .. the match is ... wait ... just a second... a perfect 100%! BTW, if you find the Jenny books - please do let me know how did you enjoy Jenny Linsky's adventures. How did I manage to miss these as a child? I devoured ALL the books at the library--or so I thought. These sound delightful. I must find them! After all, I love vintage stuff, and especially, as you say, if it's classy. What a nice coincidence - you have twins as well! I am certain that they will enjoy Jenny Linsky. Great, great! Thank you so much for taking the time to leave a comment. I enjoyed your review so much. I have twins and we may have add this to our list because they love books. I was going to do the boxcar children next, but these books may actually be next. I love to find a fellow enthusiast for the NYRB Children's books! They are so fantastic - so beautiful and unique. Thanks for the link - I enjoyed your review of Jenny Goes To Sea, its really an exciting book for kids. My twins adored it too! Thanks so much for your kind words Books4Learning! A thoughtful and thorough review :) Thanks. I found this site through a link posted by the New York Review of Books on facebook. Its a great site with reviews of great books. But if I could offer a suggestion. Instead of linking to Amazon.com could you also link to Worldcat.org. Worldcat is a global aggregation of library catalogs. It will find the book and tell where to get it from a local library. If you want to purchase the book, there's a link to amazon, barnes and nobles, and other book sellers. Instead of making Amazon the default, Worldcat makes libraries the default option. Your kind words mean so much to me. Inevitably, as a book reviewer I always know how much I left out and how much I didn't give credit to. It is difficult to press that "Publish" button, knowing that not every base has been covered. So it means a such lot to get a true compliment from an ex-children's and current academic librarian! Truly it means a lot to me - as I am "merely" a parent. And - you are a Jenny (Linsky) owner as well. Well, that really means I passed the test! Thanks so much for your words! Your words made me so happy. I loved Jenny and her adventures - and it was difficult to write a review that was not very personal. Your comment touched me - I instantly imagined the wave of nostalgia that you must feel! After you re-read them, please share your impressions as an adult too! What a lovely review! I adored these books as a child, yet until recently I'd forgotten all about them except for a vague idea that I'd once loved some books about a black cat who could skate. I'm thrilled to know they've been reissued - a definite must-have for me! What is the Best Investment Plan For Your Child's Future? All reviewed books were bought by me, after detailed consideration. I try to find the best books for my marvelous twins.